pale yellow to dark brown. Mustard gas or sulfur mustard is a chemical compound which has been used as a chemical weapon. It was used in World War I by the German Army against British and Canadian soldiers near Ypres, Belgium, in 1917. Later it was also used against the French Second Army. Most sulfur mustards are squishy liquids with no color and no smell when they are at room temperature. When used in warfare, they have a color yellowish to brown. Some of them smell like culinary mustard (the type used for food), horseradish or garlic. They got their name from the smell, but are completely unrelated to culinary mustard. Sulfur mustard (in its form mustard gas) was synthesized by Frederick Guthrie in 1860. It may have been discovered as early as the 1820s, by M.Depretz. Its use during warfare was prohibited by the Geneva Protocol of 1925. 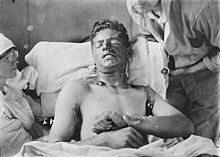 This protocol outlawed the use of poison gas (which was widely used in the First World War). An additional agreement, the Chemical Weapons Convention, was ratified in 1993. It also outlaws the production and stockpiling of such agents. Despite these prohibitions it has been used in several wars. Sulfur mustard is the organic compound with formula (ClCH2CH2)2S. It is a viscous liquid at normal temperatures. The pure compound has a melting point of 14 °C (57 °F) and decomposes before boiling at 218 °C (424 °F). This page was last changed on 23 November 2018, at 00:07.